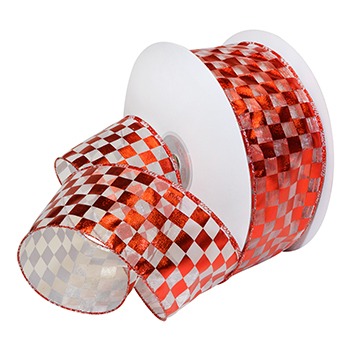 New to our holiday value line, Checkerboard Foil ribbon is sure to impress. . . for less! This wired sheer ribbon, featuring a metallic checkerboard design, is available in two popular widths and 4 dazzling colors. This ribbon is perfect for any time of the year. Create beautifully decorated trees, wreaths, mantels, packages, floral bows, wedding bows and themed parties. So versitile and the economical price and put-up make this the perfect ribbon for large projects and events!